That was Kim Anderson’s public warning to his team following their win on Saturday. NC Central dressed seven, fifth-year seniors and earlier this year played Ohio State to six in Columbus. Anderson knew their veteran team could be a handful for his young Tigers. He was spot on with his concerns. The Eagles of NC Central (4-2), a member of the Mid-Eastern Athletic Conference, never trailed and led 24-20 at halftime, on their way to a 62-52 win over Mizzou. It doesn’t take a genius to point out why the Tigers lost. They couldn’t make shots. Mizzou was held to 17% shooting in the first half and went just 17 of 68 for the game. It was the Tigers’ lowest point total since a loss to 13th ranked Arizona in December of 2015. Oh, by the way, Arizona is coming up on the schedule at the end of this homestand. Ultimately Mizzou has to be able to make shots and we’re seeing the same issues from last year creep up on this team. Right at the beginning of the game, the Tigers missed six shotsafter pulling down five offensive rebounds on its first possession. 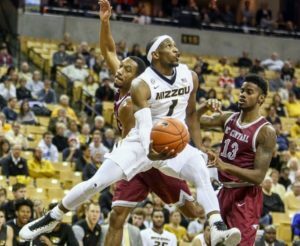 Before the Mizzou Arena crowd could sit, the Tigers missed two free throws, two, three-pointers, Kevin Puryear missed four close range shots and a three-pointer. Terrence Phillips who led Missouri with 17 points made a three-pointer 3:36 into the game. The Tigers face Western Kentucky on Saturday at 2 p.m. as they continue a five-game homestand.